To listen to this post press play. Duration approximately 4 minutes. Thank you, as always, to the excellent staff, organizers, and attendees of Metatopia. This is my favorite convention and I think any designer is well served by attending. For the sake of brevity I’m going to confine this post to the development of my own designs, but know that even if I don’t mention you here, I had a terrific time meeting, talking, and gaming with you. Metatopia is always a lovely, welcoming event and my biggest disappointment is that I have to stop being there. I had quite a table for this one, with Matt Weber, Kay Strock, Will Hindmarch, Kenneth Hite, and James Mendez Hodes. Honestly, I felt a bit intimidated by this collection of experts at my table first thing in the morning. We launched right into it and I was happy to see the game in action with these players banging on all the moving parts. The strengths of the design stayed strong and the weaknesses were, well, weak. It might seem silly but it’s the kind of confirmation that I need in order to go forward. I’ve been so immersed in the modifications to the rules over the past few weeks that I could no longer trust my own perspective. The ORCHID team set to work chasing down The Hardline after they bombed the arcology’s traffic control center. Soon enough we were schmoozing internet celebrities, crawling through maintenance ducts, and hijacking the ID chip in a rich lady’s purse. The session, though rushed, wound up with Wally Yates escaping defenestration by jamming a hidden shock knife into his assailant’s shoulder and Elaine, Marcus, and Akshay assassinating Engineer_420 with a concealed gun in the middle of a busy plaza. It’s on the right track; I can see it emulating the structure and content of the inspiration but the balancing of the rules and the things that drive you to take action are still flimsy. I need to overhaul the scene economy or a single session will run eight hours. That’s a bit much when I’m emulating a show with 22 minute episodes. Character motivation is still slim. I need more time set aside for character development and growth which means simplifying the strategic element or hiding it away. I expect I’ll be working on this one for a while to come. Jim Cummings, Matt Weber, and Michael Miller helped me put this one through its paces and it’s a lot closer to done than I thought it was. The structure held up, the concepts were solid. I might need to re-adjust the number of cards in play however. It was pointed out to me that if someone’s already on board to play a game about having a melodramatic death I don’t need to force them down to zero cards to make them play the death scene. A lunar senator fell in love with the cyborg police officer who defended her from a rioting crowd. Even though society frowned on the crudity of cybernetics and her wealthy fiance stood in the way she went with him into exile on Mars. As he sank into obscurity and depression his cyborg parts broke down and with no one to repair him the senator donated one of her own flesh-and-blood lungs. The operation cost her life however, as her own weak heart gave out and the officer disconnected himself rather than go on without her. I’m going to set this one loose after a few more rules tweaks. Both Matt and Jim want to show it to their other musical friends and see what they think. I have some grand plans for what a final product might look like but definitely need a longer list of successful playtests before going forward with any of those schemes. I didn’t bring any of my designs before a focus group this year but I always sign up to participate in one or two of them. Focus groups discussing someone else’s game are the gentlest critique of your own work you can find. While I’m contributing to the conversation to help another designer I’m also turning over the advice I hear from those around me and comparing it to my own. Some things I overheard are going back into GET9 and might help me around the issue of balancing strategy and improv. Thanks once again to everyone at Metatopia. I’m already looking forward to next year! Nathan Paoletta’s work continues and it’s really gratifying to see the text laid out. It looks like a real book! There’s still work to be done in tweaking the layout and settling in some elements. I’m on another hunt for typos as I review. In the meantime, Nathan is working on translating my Excel spreadsheet character sheets from the demo package into real character sheets. 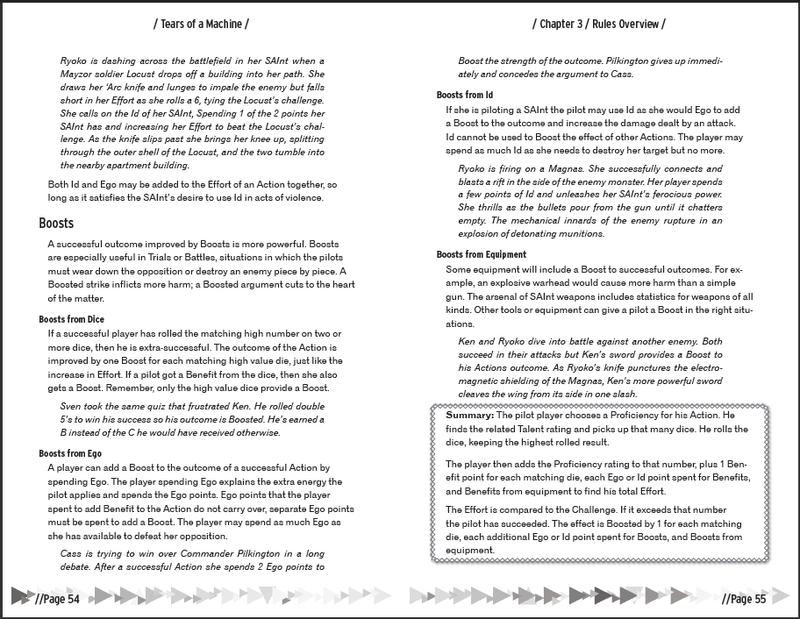 Once all of the page numbers are settled, I can begin setting up the files for the accessible text versions and soon start the audio recording for the digital talking book. Nathan recently joined the crowd-patronage support network Patreon. If you enjoy his work then consider making yourself an ongoing backer of his future projects. 70,000 Sure is a Lot of Words! Sorry that I’ve gone dark for so long and deprived you of updates! J. R. Blackwell returned the text to me with her editorial remarks and I’ve been making my way through, tweaking, adjusting, correcting, and polishing with her excellent guidance. This is the “how the sausage is made” part of the process, with lots of minutiae so there’s just not much to share. Nothing exciting at least. So while I continue to trawl my way through all these words, let’s enjoy some pleasant distractions. 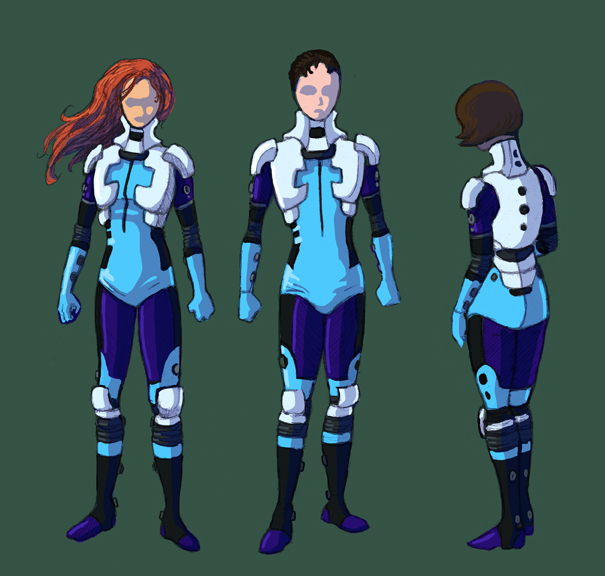 Jennifer Rodgers, our esteemed illustrator has been working on more designs for the illustrations of Tears and here’s her first draft of the pilot’s Launch Suits. Messages have slowed down, payments have been made, and we’re ready to proceed. Before the text goes to the editor, I will make one last solo pass to look for any omissions or typos and to pluck out a few more needless words. The less work J. R. has to do, the faster the book turns around and it’s just poor manners to ask a professional to deal with my misspellings. J. R. taught me an editing trick that I think everyone should know. In truth, it’s something I already knew myself, but didn’t think to apply before J. R. pointed it out to me. Read it aloud. Out loud. Mutter if you want to but don’t just silently mouth the words. You will be more focused when you engage your ears as well as your eyes and your attention is less likely to wander. Once you start using your voice you’ll quickly find passages with awkward wording or misspellings. That one-two punch of visual and auditory learning is the reason that having an audio-book format to accompany the text makes it easier to read, process, and internalize. On that subject; because of the impact that the accessibility plans had on funding Tears of a Machine, I’m preparing a presentation on the importance of accessibility for other designers. I’m planning to make the presentation at Metatopia in October. Metatopia is gaming convention focused on the designer with panels and mini-seminars about games of all types and a schedule of demos and playtests designed to find players for your game in progress. I highly recommend attending! There will be more progress reports ahead and I’ll be organizing more online chats and demos soon too. I expect that they will be on Wednesday evenings and weekends to fit my schedule but I also hope to get more of you involved, perhaps as early GMs for your own groups. Thank you and may the SAInts preserve us.